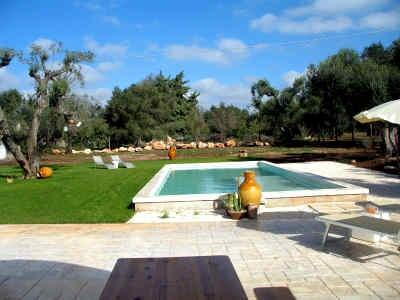 Edged in spacious grounds of tall pines lies this beautiful holiday home near the famous city of Ostuni. Casa Graziella has been completely restored and modern furnished. You will find a spacious living room with satellite TV and fireplace, a double bedroom, a shower room, one quadruple room with en-suite shower room and a kitchen living with access to the terrace and garden. There is the pool, which is 14 × 4.5 m in size and is open from April to October for a refreshing bath. Comfortably furnished is this villa with washing machine, satellite TV, air conditioning and Internet. Enjoy the sun of Puglia on the large terrace behind the house or in the garden by the pool, you can relax with a book in the shade on the covered porch at the house entrance or just let it all hang out. Certainly you will find here the right one for you in your puglia holidays with family or friends. Do you want to do something in your Puglia holiday, as are places worth visiting such as Alberobello, Ostuni, the Castellana Caves of this property quickly reached with pool by car. And for swimmers has 800 km long coast of Puglia everything from long sandy beaches, coves over dunes to rocky beaches and cliffs.